That is an absolutely ace tattoo. I was worried, up until I saw the photo. Wow. I would have to agree wtih you there. It is a cool tattoo. It is not a cool tattoo. It is ruining one of the greatest anime movies ever made. Seriously…. this makes me a bit peeved. Nothing is safe from the evil feline. It’s fan art and a deform. In fact, if the models weren’t so [email protected] expensive, I’f be considering the idea. And, yes, nothing is dafe from being kittified! Just remember it can always get worse guys…. 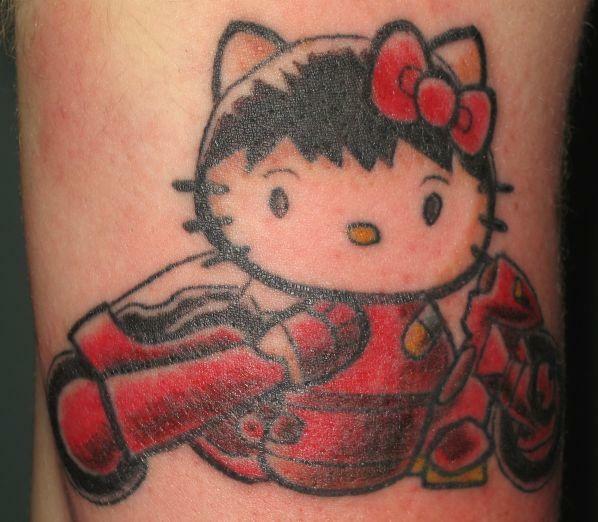 Brian, has anyone asked you to do a Hello kitty Chewbaca tattoo? Lol, nothing is safe especially around me. I can turn just about anything into hello kitty and probably eventually will. No, I haven’t been asked to do a hello kitty chewbaca yet but I was planning on drawing tattoo flash sheet of star wars hello kittys and tons of other movie/show/cartoon characters. I am new to this site. I love it and HK, but just curious what does your wife think of your blog? Do she have one too? That’s what I mean; it looks like Brian’s done a deform Kaneda in HK fancy dress. so hello kitty is a boy now? i thought that was dear daniel’s job to fill in that void. NO HK is not a boy…but you can imagine anything you want!! I’ll send in a pic of my tat as soon as it’s all healed! Me…personally…I LOVE IT!! And it’s already looking way better on my 16 yr. old daughter! She heals so much faster! There is nothing cute about Hello Kitty. It’s truly a shame when a grown woman or grown man becomes obsessed with something so deviant as Herr Kitty. I just can’t resist bagging the snot out of this idiot, so here i go again…. Firstly why the hell would this idiot paint something on his/her/it’s body that they wouldn’t hang on their walls??? can someone please tell me………!!! If your mind is so screwed up that you can’t distinguish between a good anime character and the evil destroyer of little girls you have a serious malfunction. I can suggest a good recipe for you and it is a guaranteed cure for your condition. Ok Silent Bob, here’s my take. I agree with you about the Sanrio marketting tat. I do not wholeheartedly agree with you about the fan art; that I treat on the merits of the individual piece. Yes I like this one (and most of Brian’s stuff actually): This does not mean that I like all HK fan art! Oh and incidentally, I think Akira is over-rated; nearly as much so as the Matrix trilogy (mix of Hong Kong cinema wire-fu stuff and a rehash of the Gnostic heresy). As someone who actually worked on the Matrix films at Fox Studios i wont deny that they ended up being rubbish. I today have not seen the released version of Matrix 3 But for Akira it has a certain quality to the writing style be it good or bad. I think that the HK realm is perfect for the younger generation but like everyone we eventually need to let go of our childhood some time or another. FYI… i rather like the butterfly tat. It is something that dares to say something and remove itself from that cute and sickening image that is projected. Wildly o/t, but I think the real trouble with the Matrix trilogy is that the Washowskis aren’t as clever as they think they are. Another case in point being sticking the “V-words” monologue into the film of “V”; if a monologue like that was needed, Alan Moore would have written one! Wow. I’ll never be able to watch Akira again without Laughing at you Hello Kitty Hell Dude. Wonder what Brian will come up with next? Yeah, I can say positive things too. To be frank the washowski brothers ripped off the stories for the matrix and lost the case, subsequently the studio and those hacks have to pay Billions to the real author…. I agree with you totally. The only people I’d blame for a “bad film” in that sense other than screen talent are writers, directors and producers. Ok? Do you mind being asked what discipline within film making you’re in? I’m not in that business myself. Mr. HKH, post something new soon, or I will be forced to start sending you pictures of my apartment…and the HK bathroom of hell! I design the electronics and a lot of equipment that just makes the movies work these days. so much of the movies and the frame syncing is important to get the right efx. i.e the helicopter scene in matrix and in MI2 but the best was Dark City with the mechs. Star wars was a real mind ***** with the tech in that! Could ramble on all night but i am sure that you dont want to hear about that junk. Sounds like a variation on my own job in real-time software, creating multi-source synthetic video displays? Jasmine, that skin looks mildly sunburned to me; notice how the pink is pretty constant at the bottom of the picture, and gets patchy at the top? You know, like the tattoo is about the height of sleeve cuffs on a variety of tee-shirts. i think the bad skin is becauses he/she had shaved to show off the tat.